Hi there. 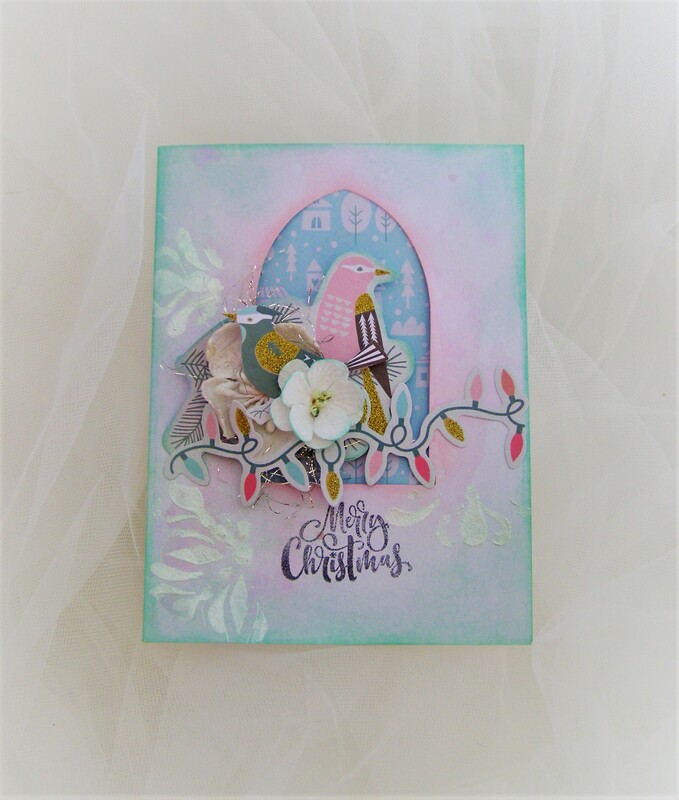 I’ve got a soft Christmas card to share with you today featuring Crafter’s Choice gorgeous new Christmas Dreams collection paired with my favourite Ranger Distress Inkpad colours. First I’ve die cut a window in front of the white cardstock and inked the edges with Spun Sugar and Cracked Pistachio Distress Inkpads and applicators. I then trimmed a sheet from the Christmas Dreams Paper Pad and adhered this under the window. 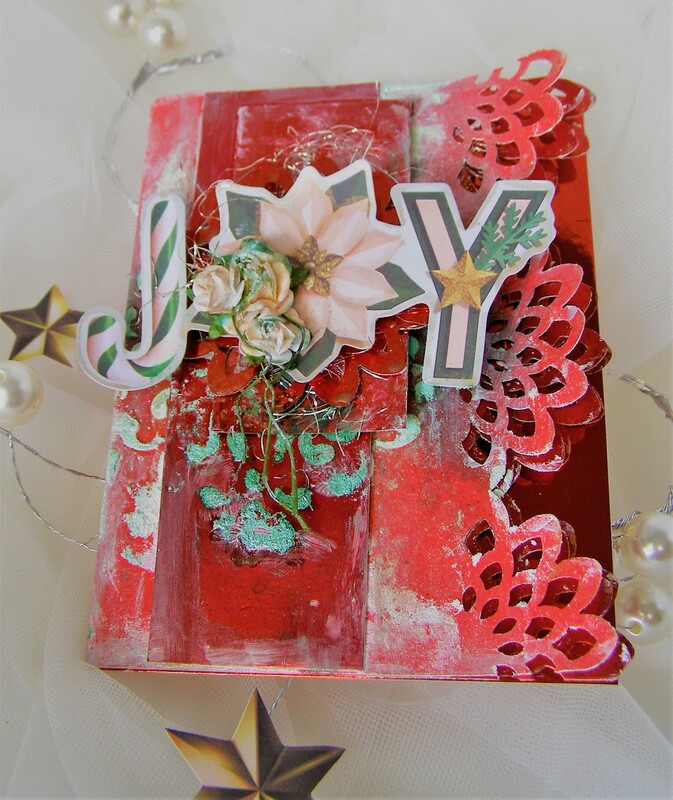 Next I stamped a sentiment from the Christmas Dreams Clear Stamp Set under the window. 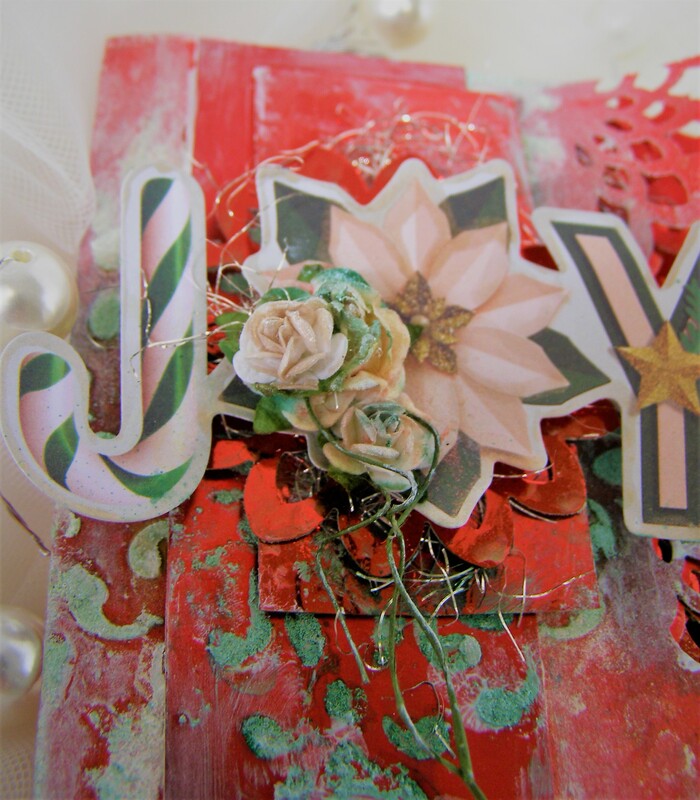 I then added some stencilling on the card and let it set to dry. 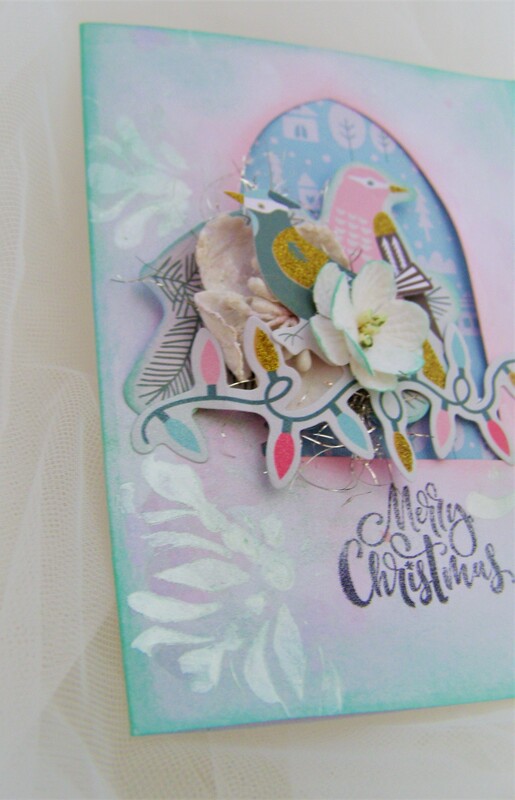 I then chose a couple of pretty pieces from the Christmas Dreams Die cut pack and layered them onto the middle of the card. A few splashes of mists and watercolor are added on top and voila! 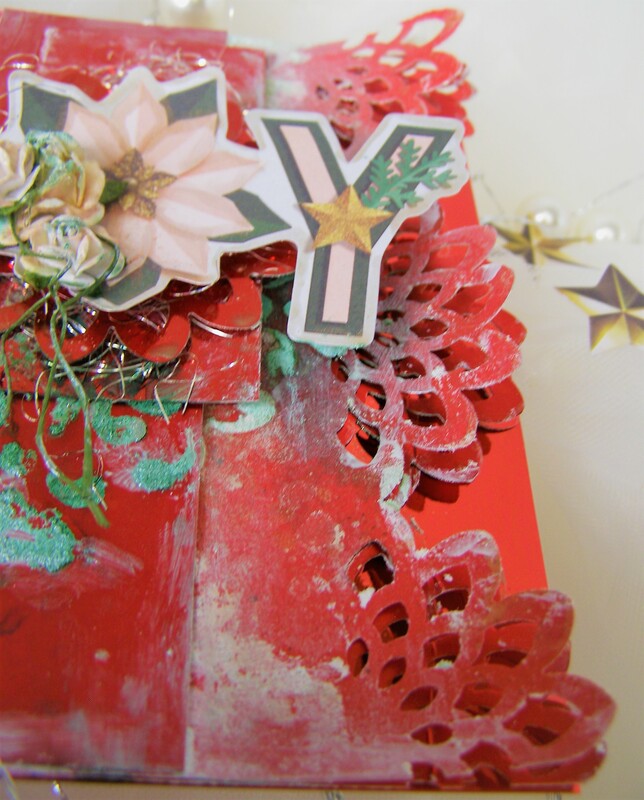 Christmas dreams card ready to go. Check out Ruby Rock-It Brands’ full range HERE or at a Spotlight store near you. Thanks for popping in. 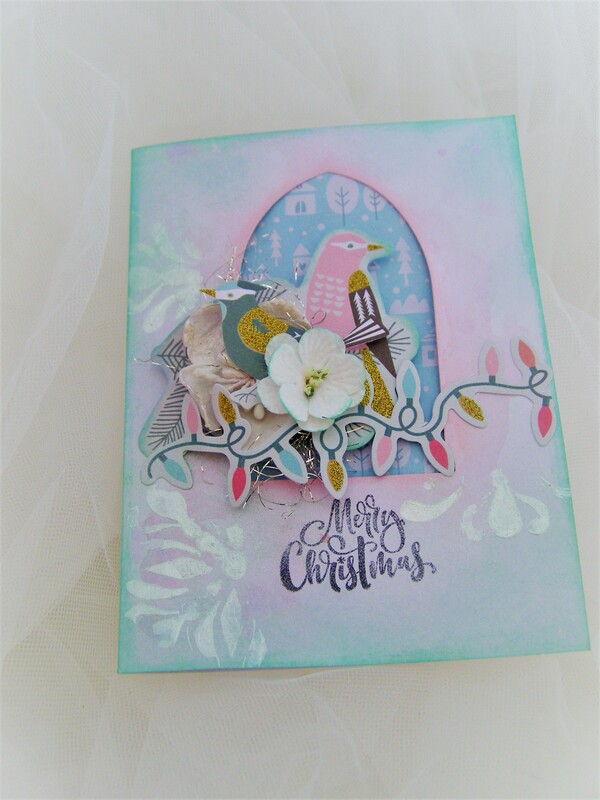 It’s amazing when you come accros an oldie but a goodie Bo Bunny collection in your craft stash, and suddenly you are inspired to create. 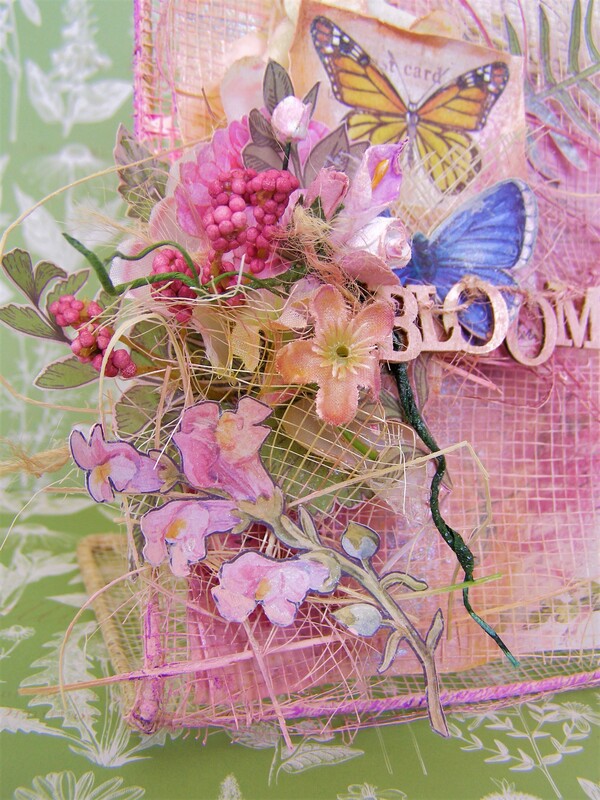 Today I’m sharing a farewell card for a former colleague with the gorgeous Genevieve collection by Bo Bunny. 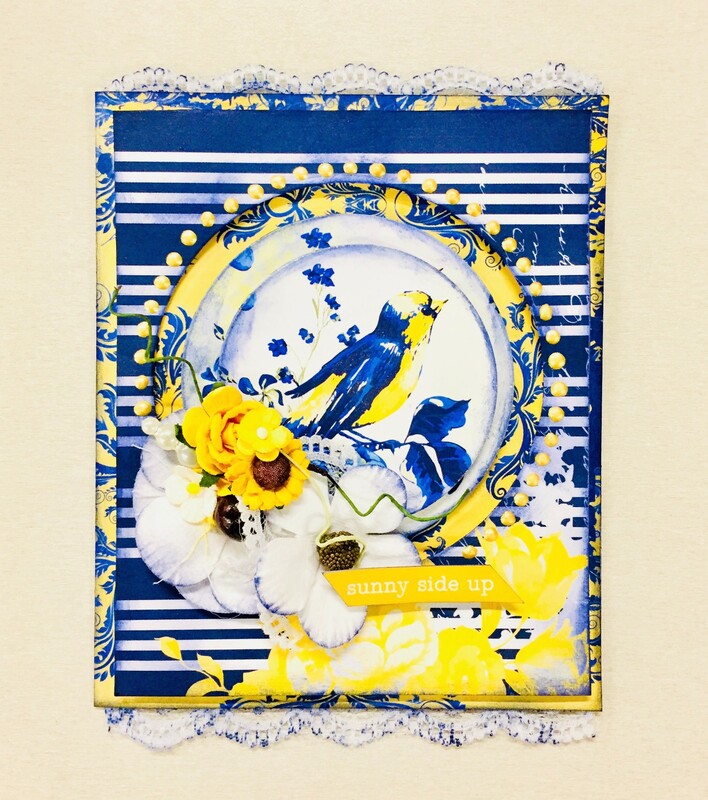 I just love the color combination of blue, yellow and white paired with classic prints for a striking mix. This by far is one of my favourite Bo Bunny collection. I inked the edges of with Ranger’s Chipped Sapphire Distress Ink and foam applicator to match the blue shades. I then added the flower cluster from 49 & Market and Green Tara flowers. Last but not the least, some Bo Bunny gold pearlescent drops are added around the circle and voila! Always look for the sunny side of life whatever it throws at you. Hope you enjoyed my card as much as I enjoyed creating it. There’s only just under ten more weeks before Christmas and I have been slowly making some Christmas cards. 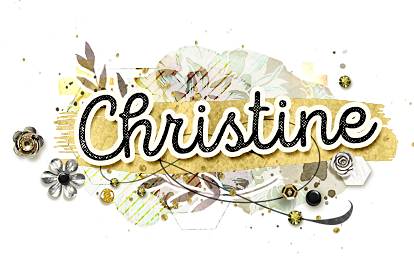 I’m excited to share with you my first card for this year’s holiday season, and it was a delight to create with the new Luxury Cardstock range and Christmas collections from Crafters Choice. I have used the red card from the New Traditions Card Pack for the base and punched one side of the front of the card. 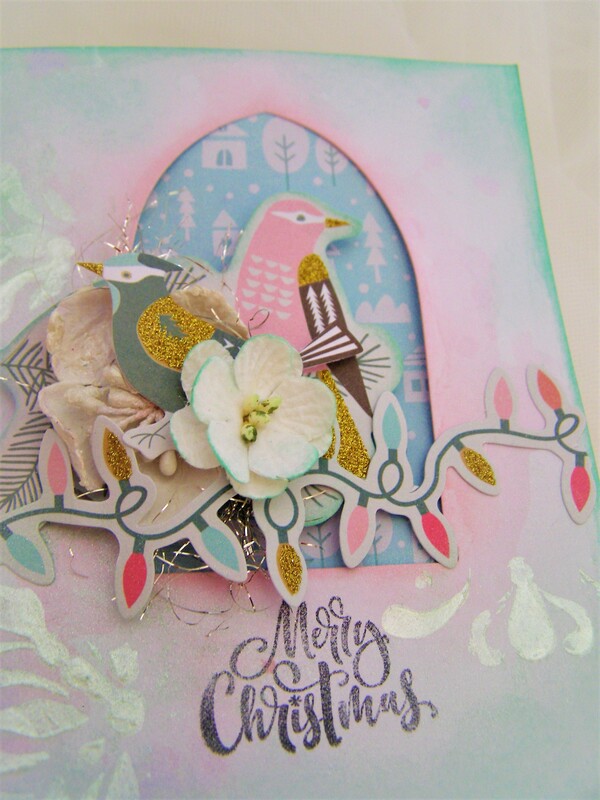 I then trimmed a Mirror and Matt Card from the gorgeous Luxury Cardstock Pack and punched one side. These are then layered under the same punched side of the card. I trimmed a couple more Matt and Mirror card pieces and layered this on top of the card. 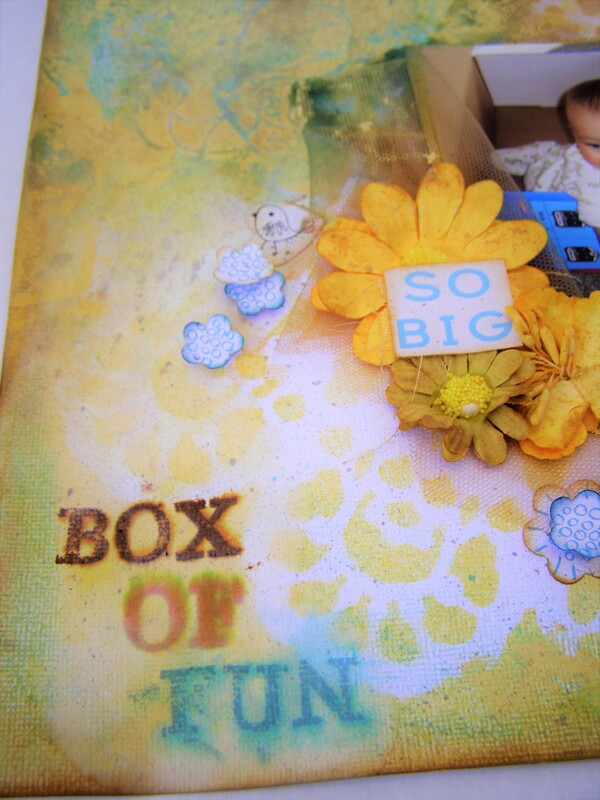 I then added some stenciling and mediums on top, and then adhered the joy title from the New Traditions Die-Cut Pack. 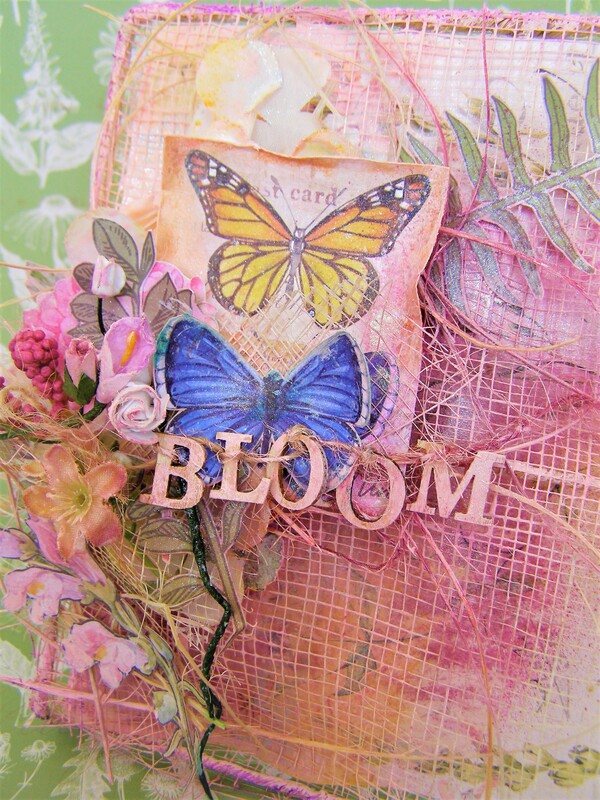 I finished the sentiment off by adding a small flower cluster to it. For a beautiful finish, I trimmed another Mirror card to size and adhered this inside the card. Last but not the least, I trimmed a small piece of white cardstock and adhered this inside the card which will give me some space to write a message. Thanks for popping and I hope I got you excited and looking forward to the Christmas season and get creating. 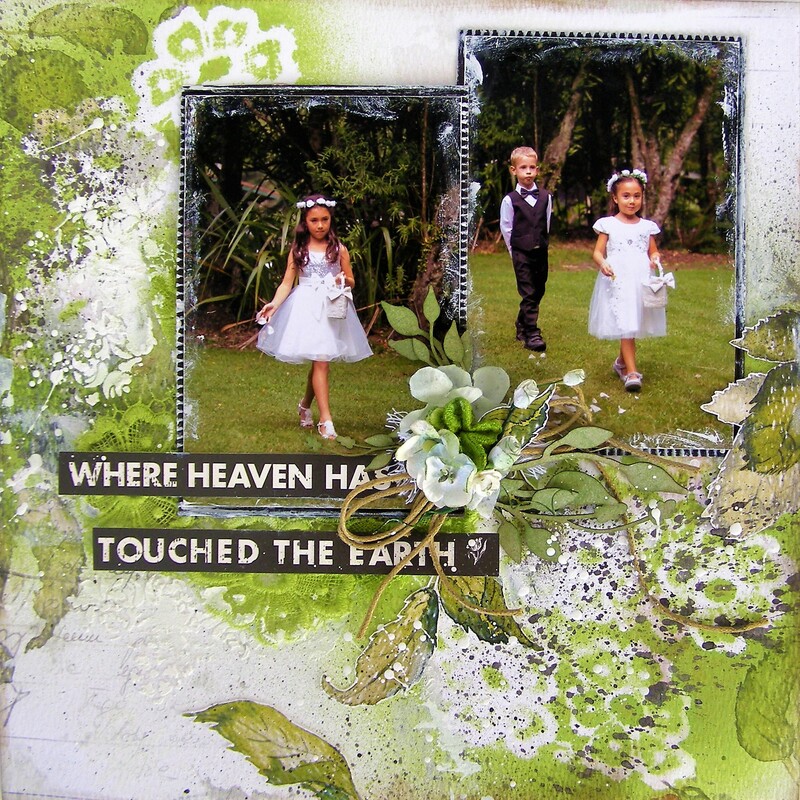 Check out the Ruby Rock-It Brands range HERE or at a Spotlight and a scrapbooking shop near you. 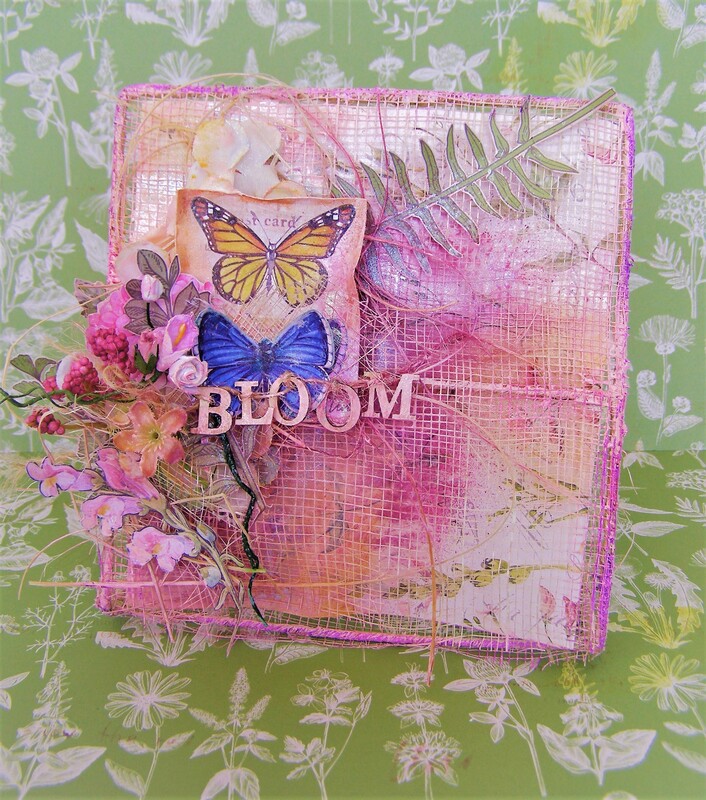 Spring has sprung in New Zealand and the sunnier weather has inspired me to create with Bella’s gorgeous Botanical collection. I wanted to fill my display with lively colors much like bright spring floral blooms. I was doing a clean up at home and found an odd piece that looked like rubbish, which I decided to keep and tranform into my spring bloom display. 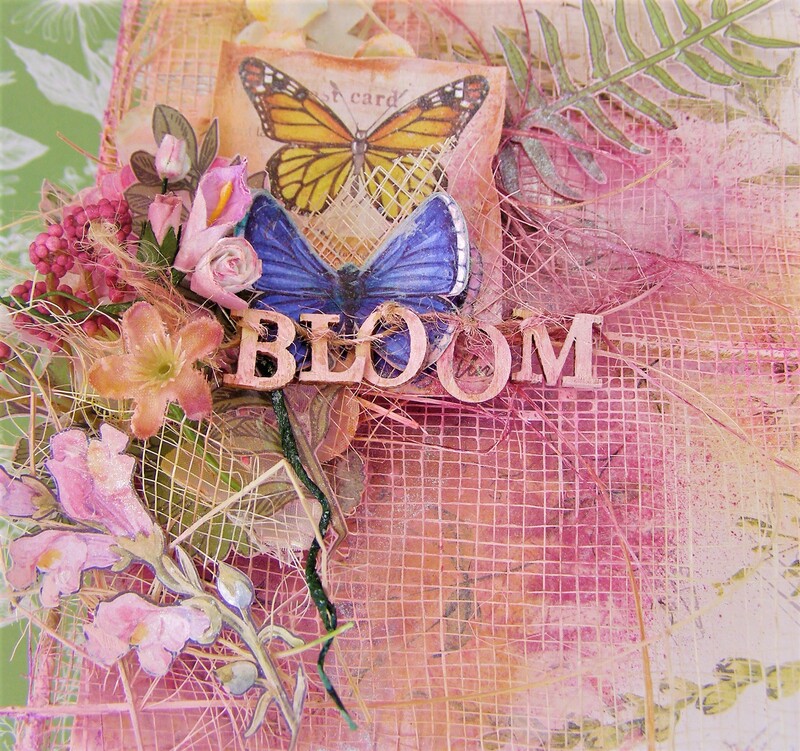 There are so many beautiful flowers, leaves, and butterflies to fussy cut from the Botanical collection which I’ve added to my cluster. 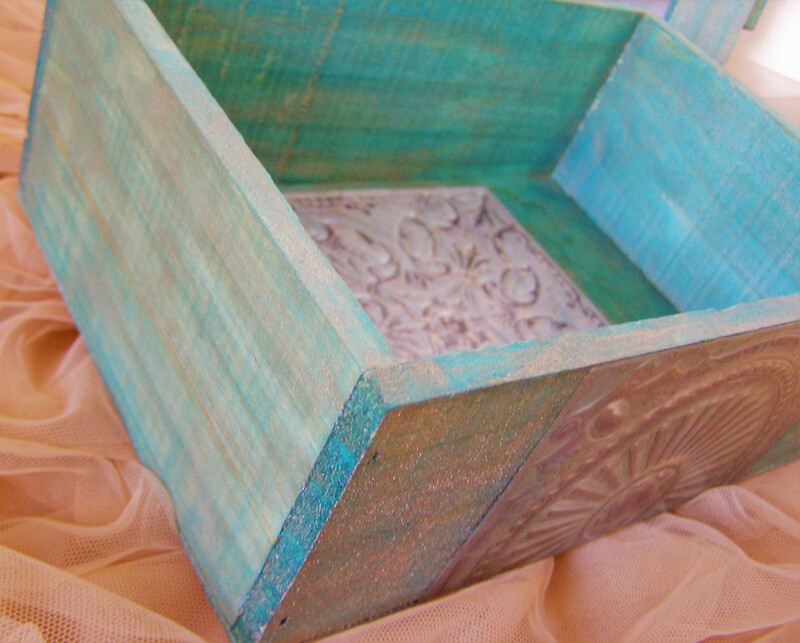 I then painted and misted around the display for a nice bright finish, just how lively spring season makes me feel. Last but not the least, I added some painted Fundamentals Alpha Wood Veneers for the title. Gotta love spring blooms! Thanks for popping and and I hope you enjoyed my bright botanical display. For more Ruby Rock-It, click HERE. 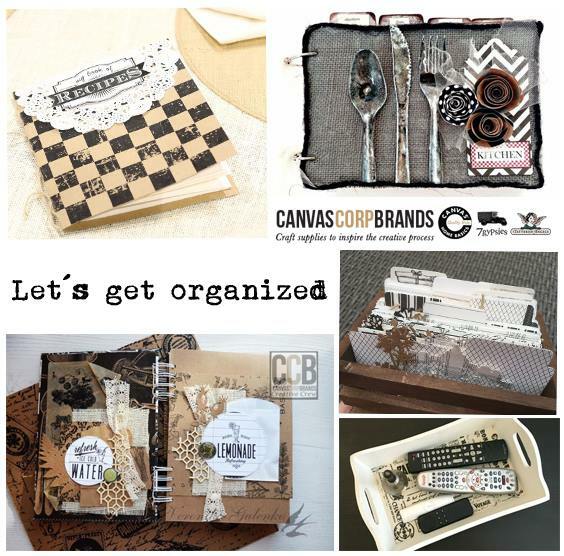 We have the September “Let’s Get Organized” Challenge at The Creative Studio for Canvas Corp Brands. The full post and link for your entry is HERE. To enter this challenge you need to link up your entry Blog post, or post on Instagram, Facebook or Pinterest (link to the actual project – not the whole page) by using the linkytool below. You have until the end of October 4 to submit your project! All submissions must have #ccbchallenge somewhere to be considered. 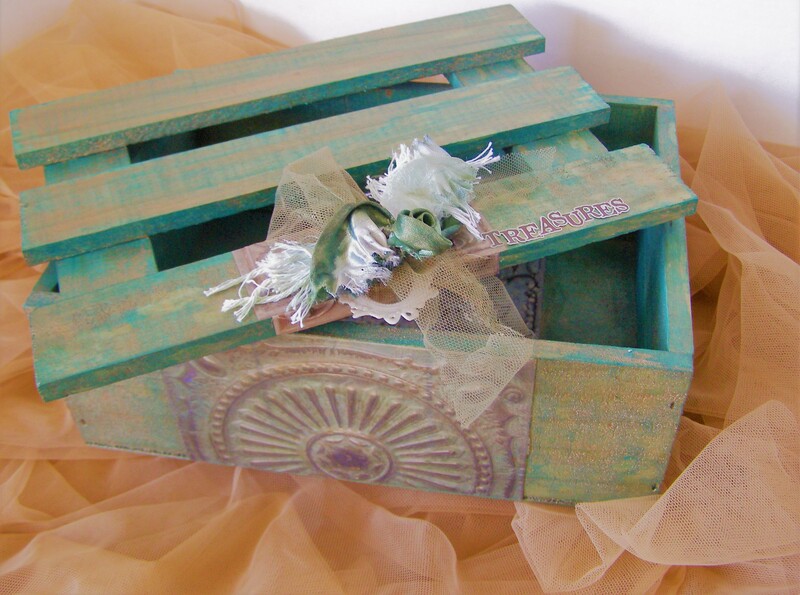 For the full post and step by step, head to The Creative Studio HERE. Link your entry HERE. We cannot wait to see your beautiful work. I’ve been getting my fingers inky with my new baby layout featuring Bella’s new adorable Nursery collection with Ranger’s Distress Inkpads. I always enjoy scrapping baby photos as it always takes me back to my childrens’ memories. 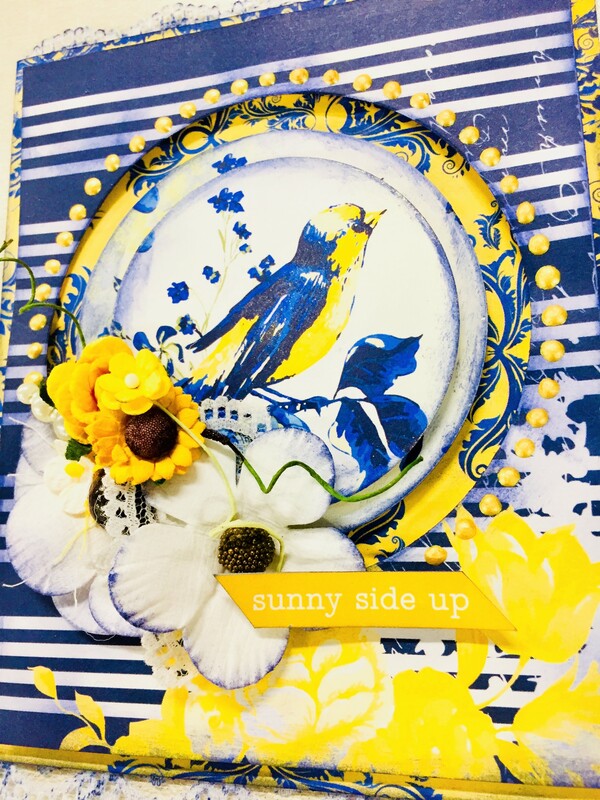 First I layered and stencilled my sunshine yellow mists on a white cardstock and let it set. I then added some mediums and combined the different shades of Distress Ink on the page for depth and color. 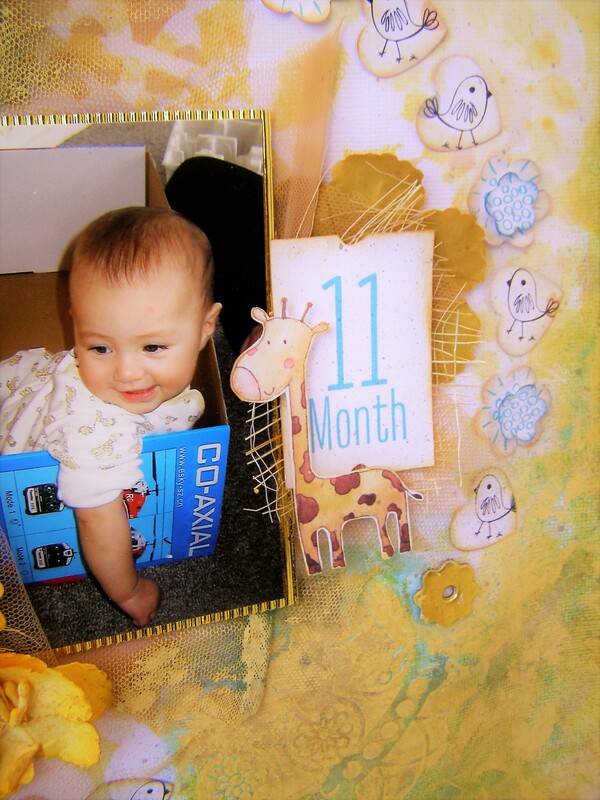 I then framed my daughter’s photo with Bella’s Gold Corrugated Cardstock. 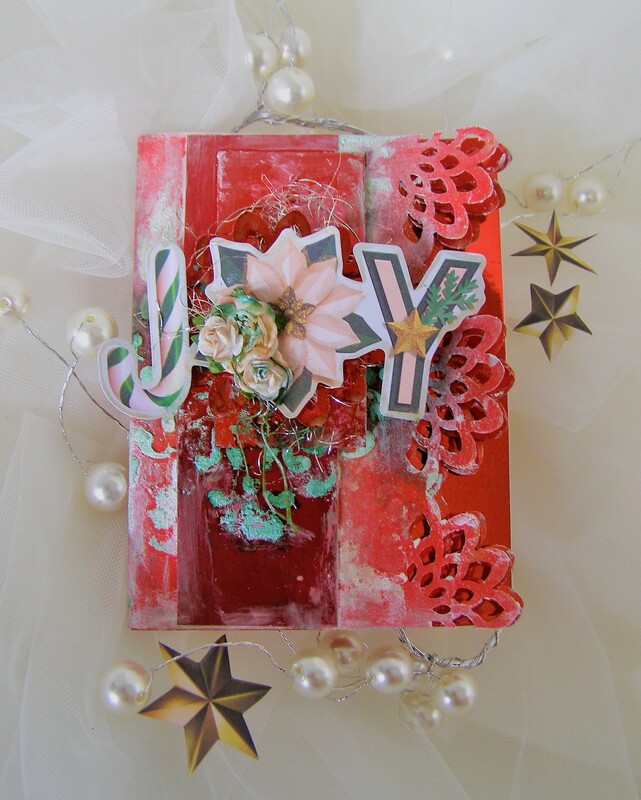 I love the shine and dimension of this versatile specialty cardstock. 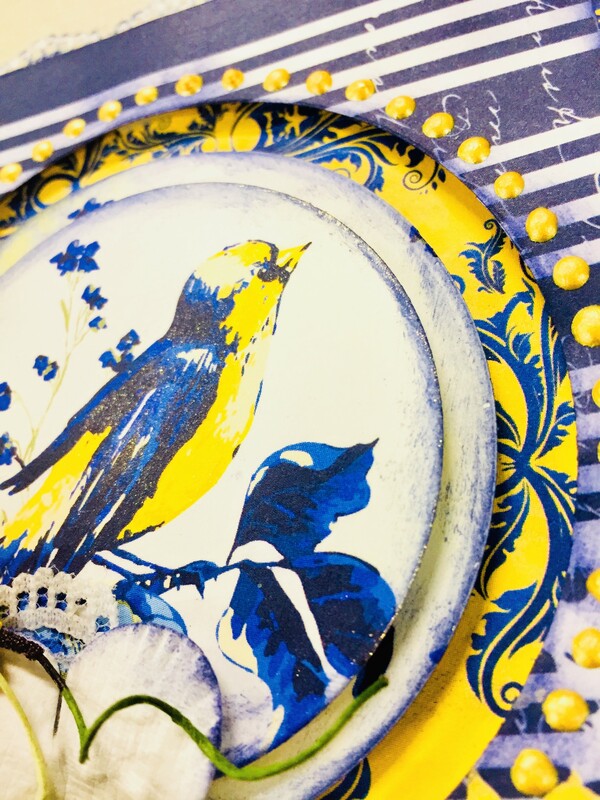 The picture is then surrounded with some pretty golden florals from the Bolt collection. Next I punched and fussy cut some sentiment and cute images from Bella’s Nursery paper collection, inking the edges with the Distress Ink. I then adhered these around the page along with a gold foiled Bolt Chipboard Button. It’s finished off with some more inking and stamping the title on the bottom of the page using the Fundamentals Alpha Wood Veneers. 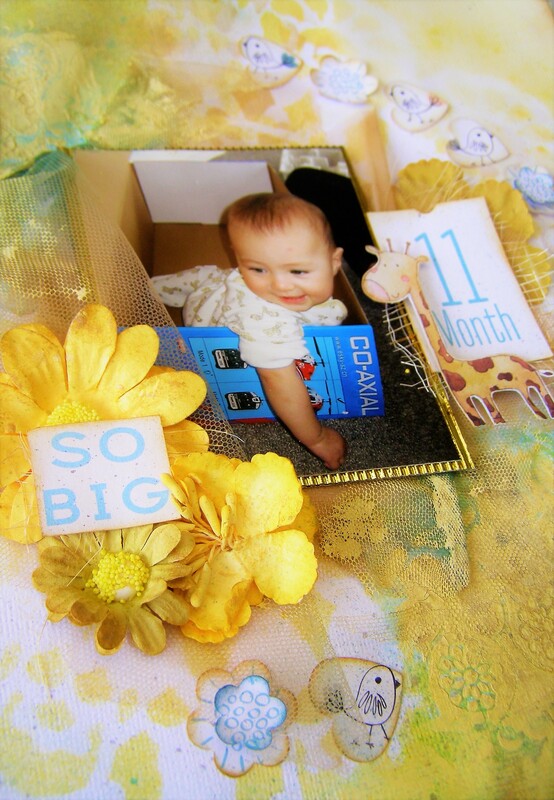 I had so much fun getting creative with my daughter’s baby photo. It’s so funny how she’s got all the toys in the world and the most fun she’s had is playing in, on, and around empty boxes. Funny that, eh? Check out more of Bella HERE or at a Spotlight store near you. I generously misted the Kiwi Glimmer mist for my background with some splattering of the Graphite Glimmer Mist and Chalk Chalboard Mist. 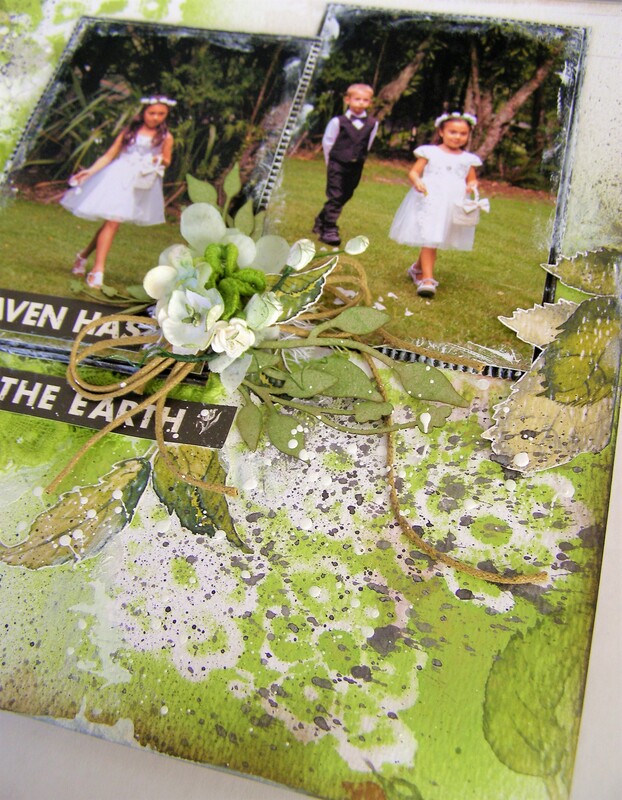 I then lightly brushed the edges of the page with the It’s Brown Glimmer Mist. 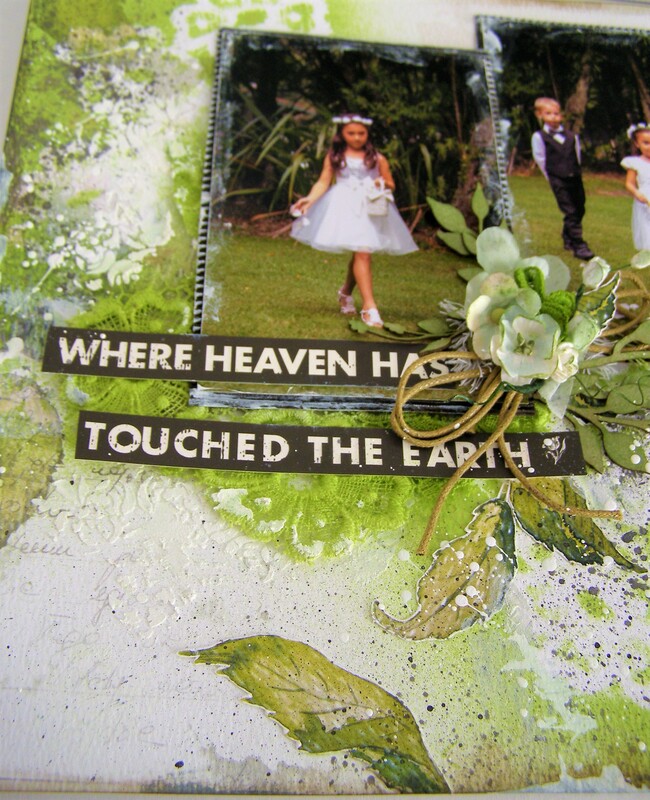 I trimmed the sentiment off the Garden Words on Ivory Reverse Paper and fussy cut some leaves from the Red Flower Pieces paper and added these to the page. Nothing can be more heavenly than have a perfect Spring wedding day and seeing your daughters walk down the aisle for you. This truly was an unforgettable memory which I will forever treasure , and I’m so happy how my page turned out. All Canvas Corp Brands’ range are available HERE. Thanks for stopping by.